When that scathing PhillyVoice report about Carson Wentz emerged last month, some were quick to wonder if Alshon Jeffery was the source of the anonymous criticisms. Jeffery was notably not among the Eagles players who defended Wentz on social media. Veteran defensive end Chris Long disputed the notion that notion, however. “Alshon wouldn’t do it,” he said in an interview with Pardon My Take. 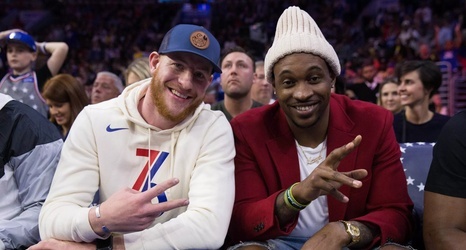 Sunday’s game between the Philadelphia 76ers and Los Angeles Lakers further disputed the idea that Wentz and Jeffery aren’t on good terms.